With many years experience teaching knitting, spinning, weaving and dyeing, Merike Saarniit is a knitting instructor who is sought-after for her finer, traditional Estonian techniques. Merike Saarniit, having dual citizenship between Estonia and the United States, is a very knowledgeable instructor in many different designs using all sorts of techniques. Merike Saarniit has a great eye for art and texture and has obtained a BA in Studio Art. 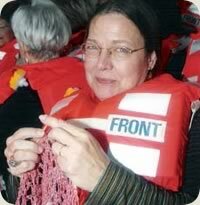 Merike finds teaching art and knitting to her students to be very therapeutic and inspiring. Merike Saarniit is also an experienced sheep farmer. Merike spins, weaves and dyes her own homegrown yarns and products which she sells at her shop Liisu Yarns. Merike Saarniit resides in Meadows of Dan, Virginia. Merike Saarniit has had a number of patterns published in Knitter's magazine, an article about spinning sock yarns in Spin-Off magazine, an in-depth article on Estonian Patent Stitches in INKnitter's magazine, and an article about Estonia in Yarn Market News magazine. Merike Saarniit was one of the featured fiber artists in the book Handpaint Country. The book Merike has been working on for the past few years is still in the works. Merike has a BA in Studio Art with a minor in History. She had hoped to complete my MA in Guidance and Counseling so she could become an Art Therapist but life got in the way. So, teaching knitting (and spinning, weaving, etc) - all involving color, texture, design - is her form of providing Art Therapy in a roundabout way.